A New Release - Exciting Times! It's almost September and my new release (in e-book form) comes out in just a little more than two weeks! Karma Visited e-book is available for pre-order through September 15, 2013 from KOBObooks,Barnes and Noble, Smashwords, andiTunesApple. My books are available in multiple e-book formats (click Smashwords links above) Kobo, iTunes. NOOK, Kindle, & other online retailers. My books are also available in Print (Amazon & Barnes and Noble), and some in Audio. Are you a member a Book Club and looking for new material? Are you growing bored by the same old discussions and need new material? Back in 1999 I signed with a publishing company to publish my story Courage of the Heart - such excitement! By 2001 when the book became available, the company had changed it's format. It went from a "had-to-be-accepted" POD publisher to a "pay-to-self-publish". They still honored my contract although they no longer offered services without payment (marketing, cover design, reviews, etc) I was stubborn and refused to pay fees that originally would have been included (the contract was detailed too loosely). Since I didn't know then anything about promotions, the book didn't go far. By 2007 I had written a few more manuscripts and was looking for a traditional (small press) publishing house when I had a conversation with L.E. 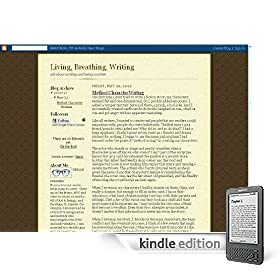 Harvey (now Lauren Shiro), she had just made a connection with Kimberlee Williams, managing editor and owner of Vanilla Heart Publishing in Washington state, and was raving about the encouragement and professionalism. I asked if she would mind if I sent Kimberlee a query for my novel Bartlett's Rule. Kimberlee accepted my query, asked to see the full manuscript and sent me an acceptance letter by email. I was so ecstatic I couldn't even talk and had to drag my husband to the computer screen to read it for himself. 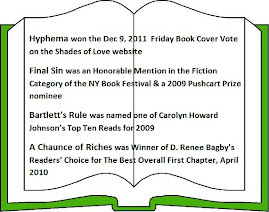 Bartlett's Rule came out in 2008 followed soon after by Forgotten (renamed and republished as His Lucky Charm) and Within the Law. Kimberlee also helped me work through the muck to get the rights back to Courage of the Heart and after a few minor edits, it was re-published under the VHP imprint. I kept on writing, mostly Romantic Suspense, and guided by Kimberlee, learned about promotion and so much more about the writing industry. My confidence level as a novelist was way high (I had been writing as a journalist for most of my adult life) and loving it all. In 2009, with Kimberlee's encouragement, I "experimented" with a murder mystery based in Emergency Medical Services and wrote Final Sin. 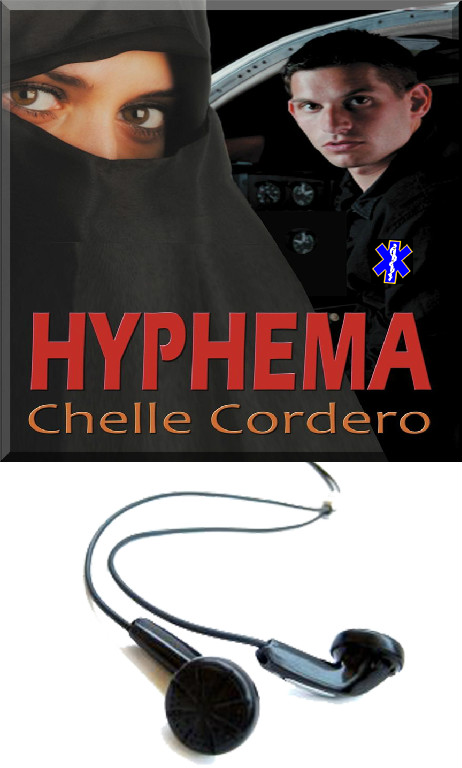 It was received very well and I followed it with the story of one of the Final Sin characters (Matt) and wrote another EMS mystery, Hyphema. 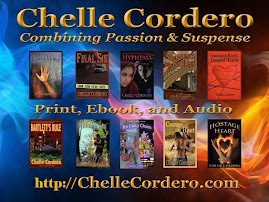 Just this past year VHP published a collection of short stories, The Many Faces of Chelle Cordero, which range from poignant, humorous, passionate and suspense themes. And now I am so very proud to report that my next novel, a paranormal suspense, is available through September 15 for pre-sale orders - Karma Visited is my tenth novel to be published at VHP! 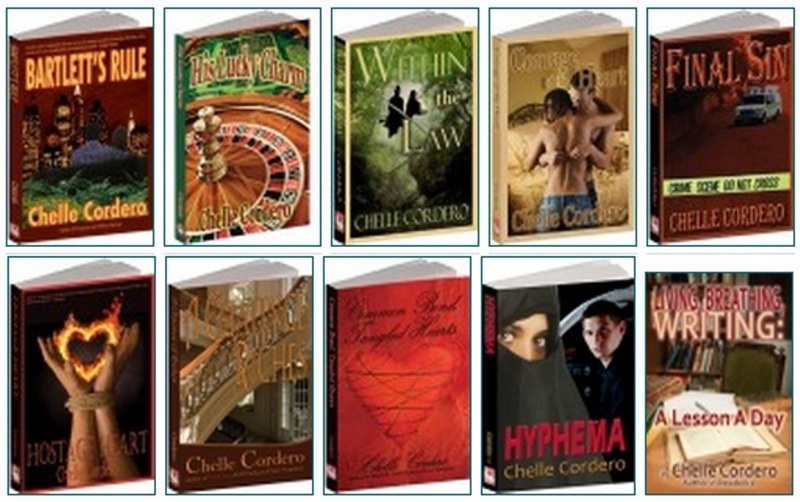 Each novel has been given great covers, book trailers and a number of promotional items/designs from Kimberlee. Kimberlee has held my hand, encouraged me, soothed my fears and has been a terrific publisher, editor and a cherished friend. She's also been on the cutting edge of the industry and my books are available in print ebook and audio (varies by title). And thanks to Kimberlee, I've received plaudits such as Honorable Mention in the NY Book Festival, inclusion in Carolyn Howard Johnson's Top Ten Reads, Pushcart Prize Nominations and more! I am so very lucky to have found her and her publishing company. Hope you'll go by and leave a comment. to help publicize my next novel. Read pdf copy - talk up the book with friends in person. 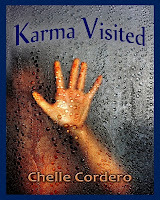 Online support - join Author Chelle Cordero FaceBook page, like, share & comment on Karma Visited posts. Visit blogs with Karma Visited guest posts and leave comments. Post the Karma Visited YouTube trailer on FaceBook and personal blogs. Include buy links. 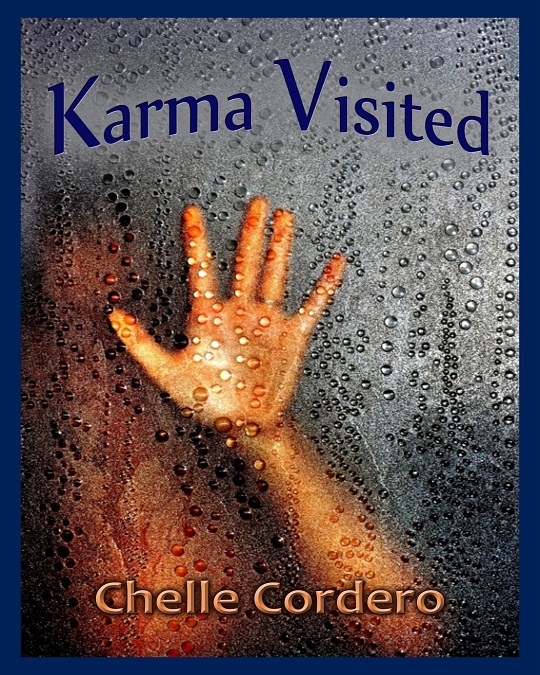 Karma Visited by Chelle CorderoDo you believe in karma? Annie Furman has a gift that allows her, while she sleeps, to visit people in their time of need - but who will be there for her when she needs help? Undersheriff Dave Turner is investigating a series of home invasions and homicides. He has no idea that solving this case will lead him to the woman of his dreams. I admit it, authors try to reel their readers in with enticing opening lines to their books. We affectionately call these opening lines "hooks". Here are a few of the "hooks" that I've used in my books. I'd love to hear from you about which ones caught your interest, just comment below. Thanks! My life changed after I died. It’s not like I had any special powers. They just didn’t understand me. They underestimated me. I had a gift. 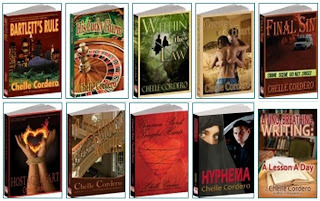 For an independent bookstore store near you, call 1-888-266-5736, or visit IndieBound.org. IndieBound supports Independent Business Alliances around the country. To find an alliance near you, visit AMIBA orBALLE. Annie Furman has a gift that allows her, while she sleeps, to visit people in their time of need - but who will be there for her when she needs help? Hi there, my name is Tigger, my mom is the author of Karma Visited. My brothers (Mario & Luigi) and I were real excited to meet one of the characters from Karma Visited. Mom gave a character in one of her other books a childhood pet that still lived in her childhood home with her dad. But this is the first time that she gave a feline a real part in her book. Tigger: Hi Mauszer, can you tell our readers what role you play in Karma Visited. Mauszer: I live with Undersheriff Dave Turner. We met when I was house sitting at the house that he rented. Now he feeds me so that I take care of the house and watch it while he goes off to work everyday. Mario: Ooh, ooh, what kind of food does he feed you? What do you do with the leftovers? Maybe I could come over and have dinner with you one day? Tigger: Hey Mario, don't be a mooch. Mauszer: Oh that's okay Tiggs. The food is pretty simple, Mario, canned stuff. Dave is a pretty simple guy, no gourmet stuff for either of us. Luigi: Hey, can I ask a question? Please... Mauszer, what is Dave like as an owner? Does he pet you a lot? Does he play with you? What's it like? What's it like? Mauszer: Luigi, Dave doesn't own me, we're really just roommates. We respect each other's space for the most part, but yeah, we have our moments when we just like to be together. Tigger: How does it feel to be the hero's side-kick? Mauszer: I don't really look at it like being a side-kick, I feel really crucial to the story, sort of like Tonto to the Lone Ranger... and if you saw the movie then you know how Johnny "Tonto" Depp really WAS the movie. Tigger: How do you feel about Annie? Mauszer: She's okay. I'm willing to share my human with her so long as she accepts that I was here first. Dave seems happy when he gets to be with her... of course she's got to really be here. This holographic stuff really freaks me out. Luigi: What did you think of Rose? I didn't like her. She;s not a nice lady. What did you think of her Mauszer? Mauszer: I only met Dave's ex-wife one time. She really wasn't nice to me at all. She came to my home, uninvited, and really acted like she belonged there. I didn't like her and I don't think Dave wants her around either. Tigger: Do you ever get to help Dave with his work? Mauszer: Well I don't get to go to his office with him, but sometimes he does bring work home. And when he's sitting in his chair reading files, I let him use me like a sounding board and let him talk thinks out. 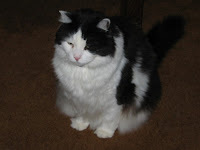 And when he gets all moody because a case isn't going well I bump into him and make him pet me... you know of course that petting a pussycat can lower your blood pressure? Anyway, I try to help keep him focused. Mario: But I think he visits us every so often and tells us fun things we can do. Mauszer: Whiskas is a real nice cat. He plays the part of a cat who survives a tornado with his human, a little girl who seems to have lost everything except for him. It's really very emotional, but I am so glad that they have each other. 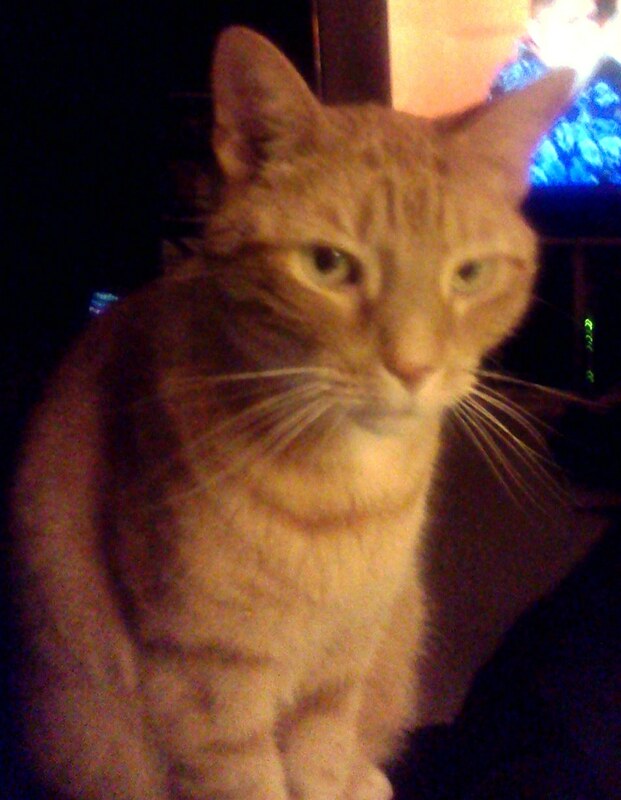 Tigger: Mauszer, I think I hear my mom coming down the hall so we really have to go. Thanks so much for taking the time to meow-chat with us today. Mauszer: It was my pleasure. Mario: We can't wait 'til Karma Visited is available in September. People are really going to enjoy getting to know you and everybody else. Luigi: Yeah. I really hope you'll be our friend. I like you. Tigger, Mario & Luigi: Bye all! on Audible, iTunes, and on Amazon! Also in All Ebook Formats and Print Editions. Ms. Cordero tackles such amazingly current topics-hate, prejudice, fear of the different, with such enjoyable, suspenseful, and well-researched background, that this reader will be following her closely to see what she writes next. Each medical scene resonates with reality, and each chapter flows into the next with a flutter in the pit of the stomach for what is coming, as well as what has been. Hyphema is narrated and produced by Tim Danko, professional voiceover artist and narrator living in Pennsylvania. and enjoys narrating mysteries, thrillers, and science fiction.